The most common trellising method is the layering system. The plants have a single stem and all side shoots (suckers) are removed. As soon as the plants reach the top of the wire (± 2.4 m high), the trellising twine is detached from the main cable and moved approximately 100-150 mm forward and lowered so that the growth point is 100 mm below the support wire above. In the following days the main growth point is gently helped to wind round the trellising twine. The winding prevents the plant from slipping down. It is important to wind the trellising twine above a flower cluster in case the plant slides down and damages the cluster. The flowers or part of the cluster should never be entangled with the trellising twine. By the time the plant is trellised again in the following week, the main growth point would have grown just past the main trellising wire. All tomato plants are layered in the same direction. Tomato plants can grow up to 6 m long in a growing season. It is thus important to layer the plants right from the beginning and to design the structure that there is enough space inside for the plants. 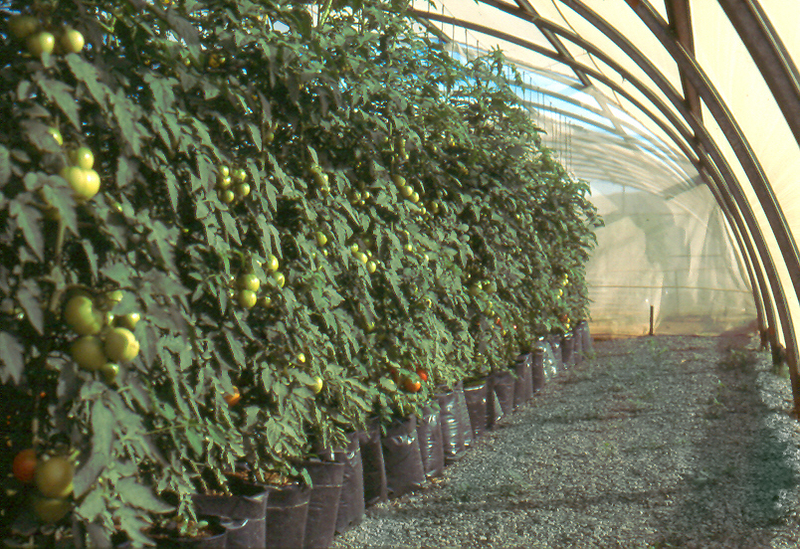 Trellising tomato plants is only done in greenhouses or when the tomato crop is grown under a structure where a trellis wire can be installed. As the plants grow, the growth point is moved along the wire while the growth bag with root system stays put.